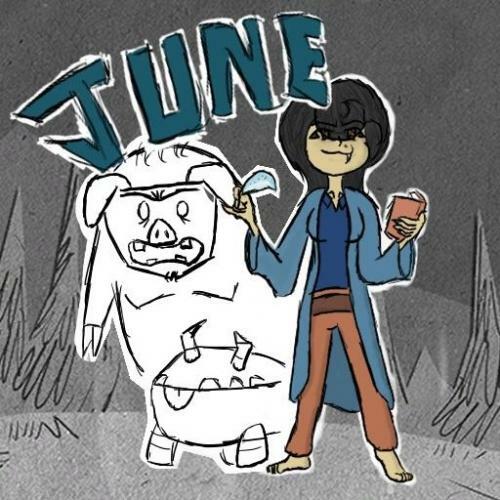 June is my own OC (from her own universe, not from Don't Starve). As such, please do not reupload this mod and or character without permission. 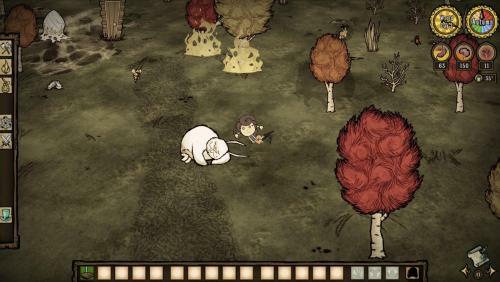 Pigmen, Rabbitmen, and Wildboars gain an extra 50% loyalty time when befriended by June. Each gains unique buffs as well! Bunnymen do not aggro on her carrying meat. 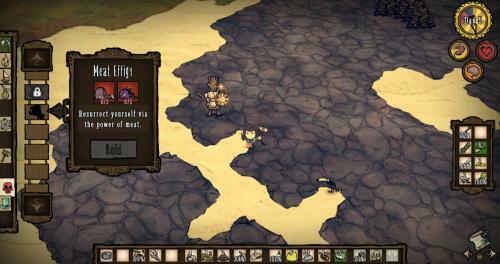 [Don't Starve Only] Can craft a Meat Effigy at the cost of 3 Meat and 3 Monster Meat without the need for prototyping! 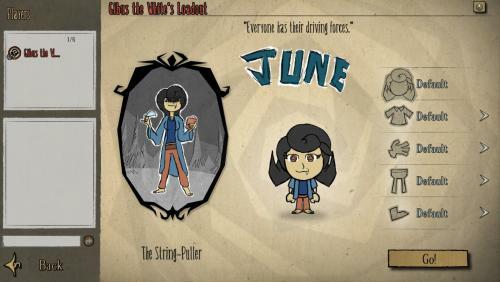 [Don't Starve Together Only] June is a pretty corrupt person, and the more loyal or numerous her following becomes, the more her corruption shows towards others. 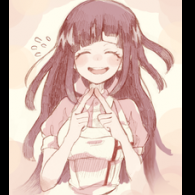 As such, if June has 3+ followers or at least 1 extremely loyal follower, she will emit an aura, draining other players' sanity. This can also scale up the more followers and or extremely loyal followers you have. June is a moderately weak character whose only shining point stat-wise is her immensely high sanity max of 300. Outside of this, her true strength lies when she finds a companion. For instance, feeding a Pigman or Rabbitman will increase their loyalty gained by the food item by 50%. This, combined with her starting inventory of 3 meat, gives you enough food from the start to keep one pig loyal for up to 4.5 days. Even smaller meals can give more loyalty, so you don't have to just feed them meat. 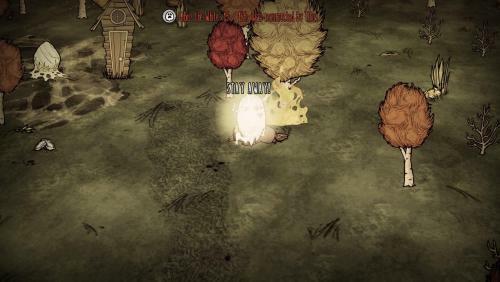 Another perk of hers is that Rabbitmen will never aggro on her when she has meat in her inventory, which makes having a following comprised of both Pig and Rabbitmen more viable for her. Her final (and most influential) perk is her ability to revive off of viable companion mobs (includes Pigmen, Rabbitmen, Rock Lobsters, Chester, and Glommer). For doing this however, the companion dies and she spawns in with only 15 health, but does not gain a max-health penalty and possibly even the killed companion's food of choice, allowing you to start the follower cycle all over again. It is best recommended to have a small following, so that when food becomes scarce, June doesn't suffer a huge amount of lost sanity. June is an anthromorph, a creature composed of both human and animal DNA. Created to live for hundreds of years and look as beautiful as if she was still young. Before her kind was given proper human rights, she was produced as a dime-a-dozen servant/slave whose sole purpose was to please her owner’s demands. However, June was a special case. Unlike other anthromorphs of her time, she was extremely intelligent and didn’t take satisfaction in pleasing her owner, so much so that when her owner got drunk one night, she fooled him into his bedroom with her, and killed him in cold blood. Of course, because of how anthromorphs were “stupid creatures who follow their master’s will,” the courts ruled out murder in favor of suicide and June got off scot free. From then on she used her mind and body to trick unknowing people into doing exactly what she wanted. 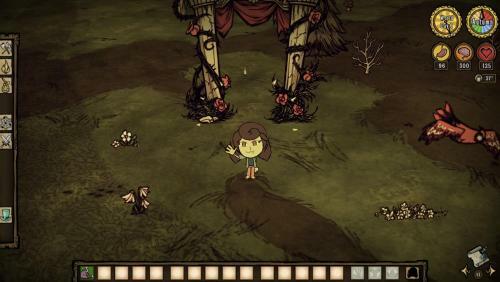 Now, trapped in the world of Don’t Starve, she finds her skills of manipulation being put to the test, as she now must use them to make her way through using this world’s smartest creatures… believe me… that isn’t saying much. 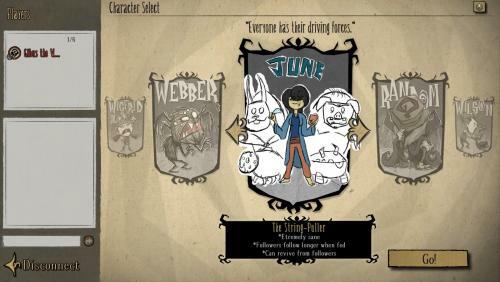 [Don't Starve Only] When saving a game and re-loading it, any companions you currently have will have their loyalty reset to 100% (50% in the case of June's loyalty increasing perk) if their current loyalty to June at the time of saving exceeded the maximum default loyalty. Fixed game-crashing bug involving multiple players and Bunnymen. This bug was a pretty sneaky one as it never crashed in single player, but when multiple players are present it rears its head. Hopefully with this done June could potentially be considered stable so long as I don't add anything code-related to her. you'll make this mod compatible for ROG and SW? Welp, there we go. After almost a week the Single-Player version is now out! Its features are included in the changelog (typo and all) but I'll put it here in the event it gets hidden. 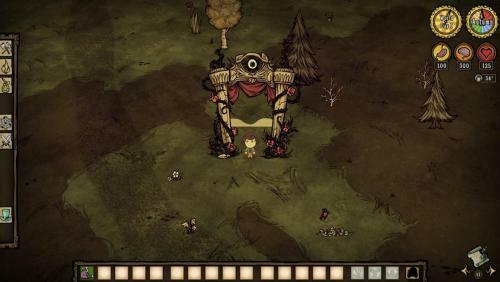 Compatible with Don't Starve, Reign of Giants, & Shipwrecked! 1000's of lines of custom dialogue from the DST version, with hundreds more custom lines for Shipwrecked! 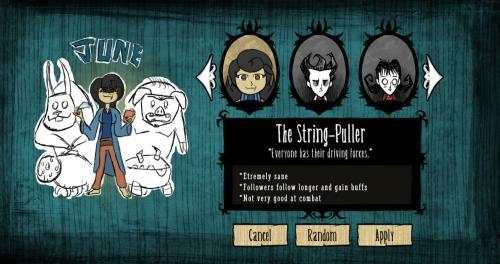 Wildbore's have their own perk upon befriending, they'll now attack twice as fast! If there are any bugs or crashes, please let me know! Now go out there and try some solo with June! June now has a sanity penalty for having a follower below 25% loyalty and can gain a sanity boost for having a follower above 75%. These can stack and even negate each other in the case of multiple followers. Followers are stronger than before when above 75%, become as strong as before when above 50%, have default stats when above 25%, and have a nerf below 25%. Followers will make it easier to tell which are higher in loyalty then others. It is no longer recommended to gain as many followers as you can with June, but rather have one or a couple followers and keep them happy so they can be as strong as possible. This should be easy in the case of monster meat farming. If the changes aren't your favorite, you can easily remove them through configurations. 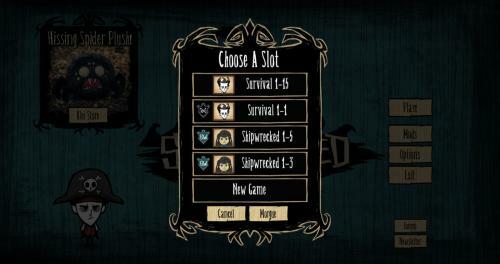 I only see two files for DS and DST, is one of them compatible for Shipwrecked? Nevermind I read the description (all of it, sorry :D) and said 1.1 is for Junes DS/ROG/SW.